I’ve kind of always wanted to make these. Never have. They sure look good though! Glad you tried out the pretzel roll recipe! We love these things with everything…they make perfect little slider buns for appetizers too! My kids and I will eat these things all day long if we could! My daughter has been using them for her lunches. I’m thinking she’s going to ask me to start making them more often! I so need to try these. Love pretzel rolls and the fact that these are a short rise is so good. Yes the short rise is the best. Though my husband did make a comment how labor intensive they are…he doesn’t know much about making bread! I’m thinking they would make good rolls for leftover turkey after thanksgiving! 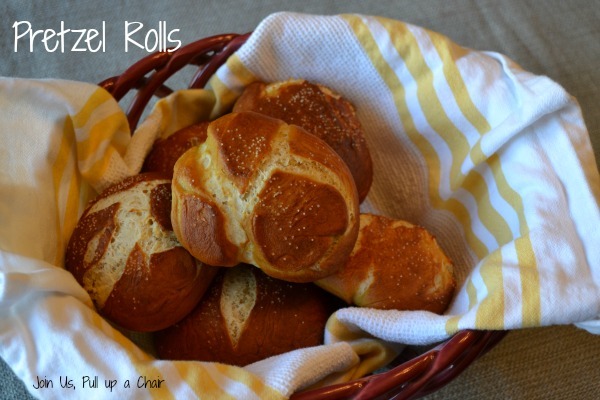 Pretzel rolls have been on my kitchen bucket list for awhile too. Can’t wait to make these with my daughter. She’ll love them! My daughter is using the leftovers for her lunches instead of regular sliced bread. Thanks Tammy! You definitely should give them a try!